Haggling with taxi drivers and camel guides costs time, energy, and often money too. 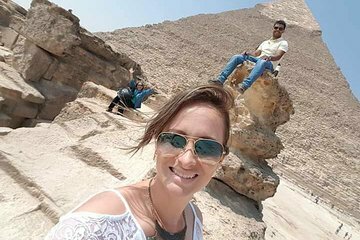 Experience the Giza Pyramids the easy way on a private door-to-door half-day tour with your own personal Egyptologist. Learn all about Khufu, Khafre, and Menkaure, who built the three great pyramids; capture timeless photos against the pyramids; ride a camel across the desert sands; see the Great Sphinx; and savor an authentic local lunch.